► The Zone Tech Multi-Functional Portable Car Laptop and Food Steering Wheel Tray is Perfect for running some errands in the car to long distant road trips and everything in between. The car tray is the ultimate Thoughtful Gift for constant travelers, truckers, car poolers and the likes. The Zone Tech portable car tray is made by Premium Quality abs plastic material to ensure Durability that will surely Last Long. ► This Zone Tech portable car tray is Portable; you can carry or store this easily in the back seat pocket while not in use. This Zone Tech product is Ideal for car travel, business office and leisure use, but also very suitable to travel with their own car, especially families with children. ► This Zone Tech portable car tray is Easy To Mount. Simply hook the tray to your steering wheel and you’ve got an instant ergonomic desk. This product can place to the steering wheel or back of the car seat in seconds without hassle. It also stores Conveniently. The Slim Design and Lightweight construction of the Zone Tech portable car tray can fit into the back of the car seat when not in use. ► MULTI-FUNCTIONAL – The Zone Tech portable car tray can be mounted to steering, assistant seat and seat back. This portable car tray can be used by driver for food or as a notebook support or desk providing convenient place for notebook, grocery food, drinks and etc. ► PORTABLE – This Zone Tech portable car tray can be carried or stored this easily in the back seat pocket while not in use. This Zone Tech product is ideal for car travel, business office and leisure use, but also very suitable to travel with their own car, especially families with children. ► PREMIUM QUALITY – The Zone Tech portable car tray is made by premium quality abs plastic material to ensure durability that will surely last long. ► STORES EASILY – The slim design and lightweight construction of the Zone Tech portable car tray can fit into the back of the car seat when not in use. ► EASY INSTALLATION – This Zone Tech portable car tray is easy to mount. Simply hook the tray to your steering wheel and you’ve got an instant ergonomic desk. 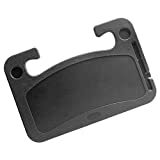 This product can place to the steering wheel or back of the car seat in seconds without hassle.
? The Zone Tech Multi-Functional Portable Car Laptop and Food Steering Wheel Tray is Perfect for running some errands in the car to long distant road trips and everything in between. The car tray is the ultimate Thoughtful Gift for constant travelers, truckers, car poolers and the likes. The Zone Tech portable car tray is made by Premium Quality abs plastic material to ensure Durability that will surely Last Long.
? This Zone Tech portable car tray is Portable; you can carry or store this easily in the back seat pocket while not in use. This Zone Tech product is Ideal for car travel, business office and leisure use, but also very suitable to travel with their own car, especially families with children.
? This Zone Tech portable car tray is Easy To Mount. Simply hook the tray to your steering wheel and you’ve got an instant ergonomic desk. This product can place to the steering wheel or back of the car seat in seconds without hassle. It also stores Conveniently. The Slim Design and Lightweight construction of the Zone Tech portable car tray can fit into the back of the car seat when not in use.